If a picture paints a thousand words, then a place can tell a thousand stories. No where is that more true than Freyberg Square in Auckland’s High Street precinct, which has played host to millions of people over the years, and provides the backdrop for many of their life stories. When it therefore comes to redeveloping the square to support the evolution of our cities’ public life, there is a significant responsibility and opportunity for designers to reference these histories. 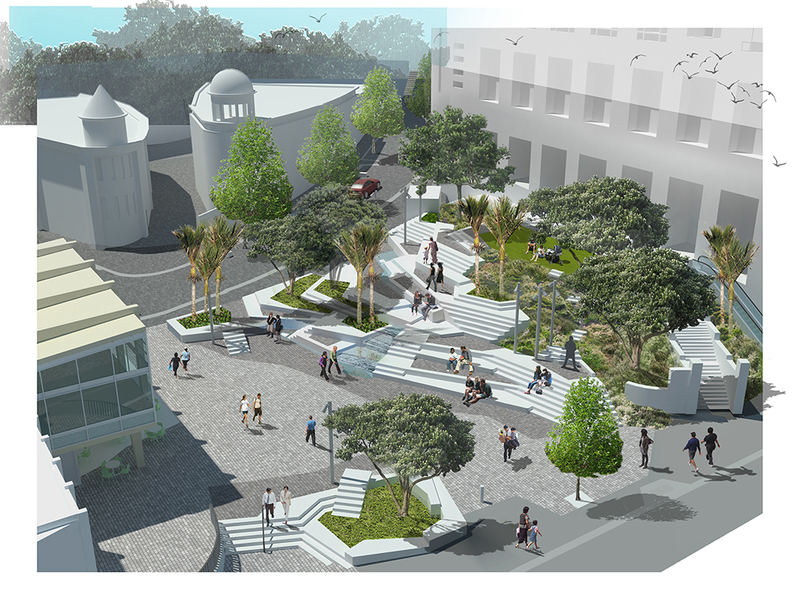 Auckland Council is currently inviting Aucklanders to engage on emerging proposals for the new square, and to understand how its history should be considered. 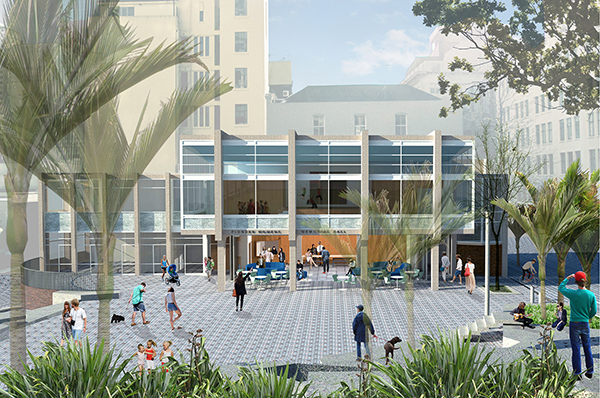 The ambition is simple; to fuse the best aspects of the current square – as a sheltered space of refuge from the hustle-bustle of city life, with new opportunities for the future use of the Pioneer Womens and Ellen Melville Hall, as a community hub managed by Auckland Council. Like most of Auckland, Freyberg’s history can be traced back to the geological forces that have sculptured our landscape. The square sits on the toe of one of Auckland’s oldest volcanoes, which erupted under what is today the site of the Metropolis apartments. The current scheme design interprets this volcanic landform on the southern side of the square through a composition of terraces and steps that provide different spaces for individuals and groups to bask in the sun, or shelter under the dappled shade of the proposed native trees that are placed across the terraces and rain-gardens. 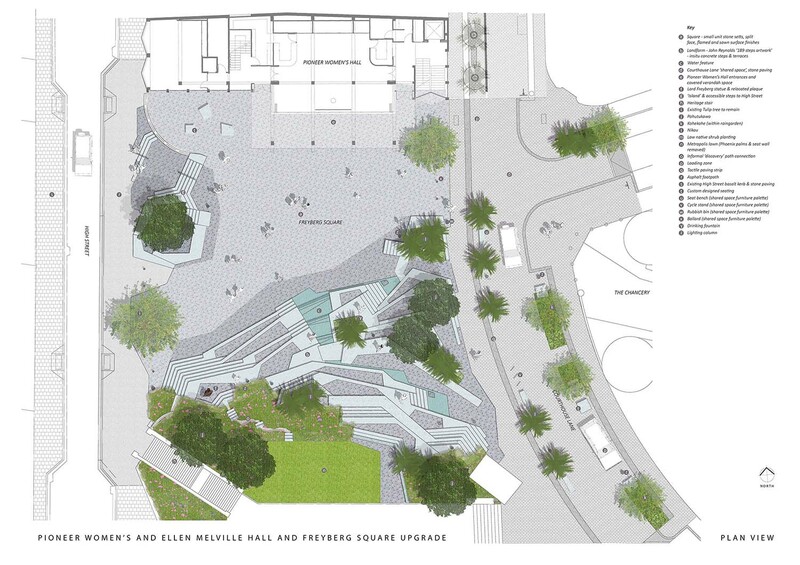 This concept also provides an informal amphitheatre for the square, and offers the tantalising potential for a range of new activities and events to be held within Freyberg Square, supported by the upgraded facilities of the community hall behind. The steep topography of the hillside presents a challenge for connecting the cafés within the Metropolis development with the square below, and the terraces help to seamlessly blend the public and private land, enhancing the visual and physical connection. The ambition is to promote access and use of these cafes into the evening, providing better surveillance of the square, and improving perceptions of safety and security in the High Street area. The terraces are formed from a palette of in-situ concrete and small unit-stone paving in a mix of colours that subtly reference the geology, whilst providing a robust and maintainable surface to host the widest range of events within the square. The current water feature, which is a popular play space for many of Auckland’s children, has been incorporated into these terraces as a more natural, interactive element that flows down through the terraces. This is one of the many features that respond to the feedback provided through an innovative children’s engagement event hosted by council, researchers from Massey University and the design team earlier this year. The square’s namesake, Lieutenant General Bernard Freyberg, currently stands ‘in the bushes’, alongside the historic steps that led up to the Court House, which used to stand on the current Metropolis site. The new scheme brings Freyberg’s statue into the fore, allowing more playful opportunities for the statue to engage with the public life of the square. Directly opposite stands the Pioneer Women’s & Ellen Melville Hall. Designed by Auckland City Council’s Architect’s Office, under the direction of Tibor Donner in 1962, it is now considered a fine example of sixties modernist architecture. The original design was conceived of as three distinct forms, which include the spacious first floor hall raised above street level and supported on ‘piloti’ or free standing columns, with a floating butterfly roof. By articulating these key components as distinct architectural forms the overall scale of the building was reduced, a key aspect to integrating a relatively small building into the urban environment. Elevating the hall above the street created the open space below as a continuation of the public realm and further worked to interconnect the building within the urban setting. These key design concepts of the original building will be recognised in the building upgrade. The proposed scheme aims to enhance both the visual significance of this building, and the original ‘indoor-outdoor flow’ with the square. The creation of a sheltered verandah space at ground level will allow the square to extend under the first floor, and provide a space for the building’s community activities to flow out, establishing a seamless connection between the hall and the square itself. It’s not only ‘older’ history that’s important, but also how the square is used today. For many it provides the opportunity to escape the hustle and bustle of city-life, a quiet oasis of calm for a lunchtime bite to eat, or a place to meet and catch-up friends without forking out for a coffee. The new scheme looks to enhance the number and range of spaces for such activity, harnessing the shelter from the predominant winds, whilst providing much needed shade over some seating areas in summer months. A range of seating options are scattered throughout the square, with universal design a key consideration to ensure the facilities and spaces are as accessible and comfortable as possible for the widest range of Aucklander’s. Some seating provides back and arm rests for those needing it, and an accessible terrace allows people with prams or in wheelchairs to inhabit the centre of the volcanic hill, and enjoy views out to High Street and the hall, or a performance in the square. Design is always an art of compromise, and a key question for Aucklanders engaging in this design project is how successful the designers have balanced the referencing of the past with the needs of the future? Are there more opportunities for subtle reference, or have opportunities been missed to improve the comfort and accessibility of us all? Now is the time to help to evolve the design, by engaging in the debate at ShapeAuckland.co.nz. Engagement closes on September 27th 2015. Interesting to see the way the square deals with the removal of the road, definitely seems to offer up more space for events and using the space more. Lots more options for seating too. Its a massive improvement on what’s there already. Who designed it? Isthmus Architects designed the square, working in collaboration with the artist John Reynolds. The community hall re-design has been led by Stevens Lawson Architects. I suppose the increase usable space would also encourage an increased variety of activities occurring in the site, also would be interesting to see what sort of street furniture the designers use to liven up the place, another interesting point is the different functions proposed for the community hall, i wonder if a extendable modular design which allows the hall and its functions to further extend into the square can be explored? for example collapsible canopies which can extend over the square etc etc? Thanks Alex, some good ideas for activating the space. All comments will be collated by the project manager leading this project and reviewed as part of the current engagement process. I also wonder what was the specific design response for wind zones in for the square? the area in its current state can be rather windy at times , and this combined with some bad weather meant the area is rather unwelcoming at those times, this is addition to the added complexities the metropolis building bring into the table, buildings of that size creates their own weather patterns and may have an adverse effect to the overall user experience of the area. on a side note, it is great that you guys kept the water feature, it is very unique for Auckland and is a great attraction, especially for the young ones.